Kicking off our amplifier article updates, we first looked at the budget beauties in the entry-level market. Thankfully most models we feature are still readily available, although we removed the slightly dated Acoustic Lead Guitar Series G20 and replaced it with the cool Line 6 Spider Classic 15, as well as adding the Pignose Legendary 7-100. What Should You Look For in the $100 Amp Market? Should I Bother with a Sub-$100 Amp? Contrary to popular belief, it is much harder to find and choose a good affordable amp than it is a top tier one like the models you see on our own list of best amps. There are so many factors you need to worry about, which can be rather overwhelming. Because of this, we have decided to do the footwork for you, and find out which guitar amplifiers offer the best value for your money. We have included various power ratings, sizes and styles of amps, so that you are guaranteed to find something no matter what your preferences are. With that said, lets get right into it. A compact modeling amp packed full with awesome features and versatile controls. Solid state perfection delivered by one of the best brands out there. From clean to djent at the press of a button! One of the smallest and basic but still great sounding Orange amps. Hard to fault this legendary practice amp! A very distinctive amp that brings tube tone to the budget crowd. One of the most unique looking and extremely capable micro amps available. Small, mobile and versatile micro amp that comes at a great price. Blackstar has already established their presence in the budget segment with their impressive tube amps. This time around, they are showing the world just what they are capable of delivering in the modeling segment of the market. Blackstar ID: Core 10 V2 is a multi-tool every guitar player would want to have in their bedroom. With a vast range of voices, presets and effects, ID: Core 10 V2 comes across as one of the most versatile budget amps you can get your hands on. But wait, there's more. On top of an already impressive hardware aspect, there is also a software side to this package. You get Blackstar's own INSIDER software as well as Presonus' DAW suite to work with. Vox Pathfinder 10 represents what Vox is capable of offering to the budget crowd. As expected, the results are pretty amazing. With an exterior designed borrowed directly from their famous AC30, Pathfinder 10 is one of the better-looking models in this price range. Performance-wise, you are looking at a truly versatile practice amp that delivers both in terms of cleans and overdriven tones. 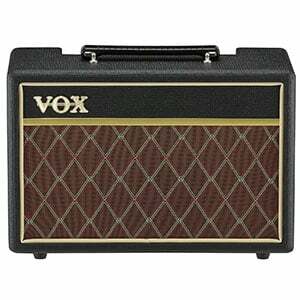 Being a solid state model, no one really expected any of that legendary Vox tone. However, that is exactly what we received. Even though it is obviously rendered by digital circuitry, the tone still brings some of the Vox signature vibes we all love. Simple and effective, Pathfinder is one practice amp you should check out. Line 6 is a brand well-known for its digital modeling and the Spider Classic 15 doesn’t disappoint on this front, offering four awesome preset amplifier models (clean, crunch, metal and insane) and two Smart FX dials to give a range of digital effects. Simple but robust in design, this all-black amplifier features a single 8” speaker with 15 watts of power. This makes it a great little partner for practice and jamming sessions. As we mention in the complete Spider Classic 15 review, the sound that comes from this amp is fantastic, especially the high-gain metal model. For beginners and anyone wanting an affordable practice amp with solid onboard effects, this is a worthy contender for your cash. 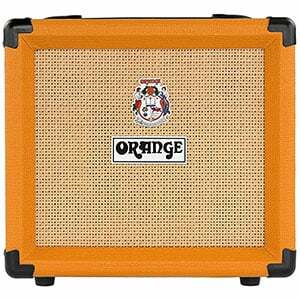 Orange Amplifiers offers a whole range of awesome amps that will get you that legendary 'Orange sound'. However, they also have a very impressive line of affordable amplifiers which are designed to give you a portion of that legendary performance on a budget. Crush12 is the smallest box they offer, but it packs one mean punch. Simple, effective and with a killer sound, this model is a perfect fit for those who need a reliable practice amp to use at home. The sound this thing brings to the table is tuned to replicate the sound you get from their full-size stacks. That alone means that you are getting way more than just a budget practice setup with Orange Crush12. 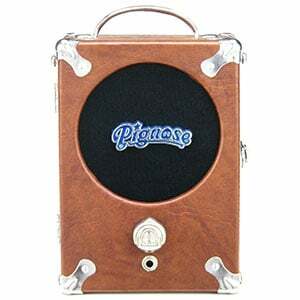 As the name suggests, the Pignose Legendary 7-100 is a true legend when it comes to mini amps! With a compact design and 5” speaker, this affordable little 5-watt amp offers a unique vintage suitcase style with an incredibly simple operation that makes it perfect for both beginners and travel alike. While controls aren’t this amp’s strong point (in fact, there’s nothing more than an on/off switch) and versatility is down to your guitar, the Legendary 7-100 delivers a great tone for practice, with an almost tube-like clean sound, while you can achieve some real vintage fuzz as you increase the volume. Be sure to check out the full review of the Pignose Legendary 7-100 for all the details. Peavey's lineup of affordable solid state amps hides one of the most interesting budget models on the market. Peavey Backstage was designed to offer something only a few brands even attempted to do - a solid state amp that sounds like a tube box. Needless to say, they've managed to pull this off, thus giving anyone in search for a vintage tone, a great alternative that won't ruin their bank accounts. 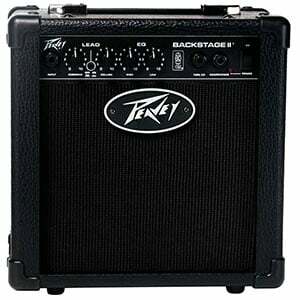 Simple both inside and out, Peavey Backstage delivers great performance and carries more than enough volume to for a practice amp. If you simply need a taste of tube amps in your life, make sure to check out the Backstage as it's among the most distinguishable amplifiers of this kind. When mobility is a factor, you will find some pretty compact amps. Going even further down the scale, there are micro models which few ever really look into. This is perfectly normal considering the performance limitations this class of amps has to deal with. Blackstar's FLY 3 is one of the rare exceptions to that unwritten rule. With only 3 Watts of available power, this thing brings on the thunder like you would never expect to see from such a tiny package. With a very versatile set of controls and even abuilt-in delay effect, Blackstar FLY 3 is among the most capable micro-amps on the market. On top of that, it also comes with a unique design. Fender's amplifiers are well known as some of the best in their respective categories. This type of reputation also applies to micro-amps. Fender Mini Deluxe demonstrates just how good of a tone you can get in a form factor that is almost small enough to fit your pocket. With a 1 Watt output and its single 2-inch speaker, you can count on having a rather decent performance on the road. Powered by either a single 9V battery or a wall wart power adapter, you can use this amp at home for practice purposes as well. The absolute best feature Mini Deluxe offers, however, is the price. To put it simply, it doesn't get much more affordable than this. The main reason most players would buy a guitar amp for less than $100 is to have a decent practice partner for home playing – whether complete beginner or experienced guitarist with limited space. Although you will find some models in this entry-level price range are suitable for smaller gigs, these tend to be the exceptions. So, what should you look for in a sub-$100 amplifier? The performance is not going to match that of an amp in a more expensive category, although you can still find a fantastic tone for low-volume playing. Of course, this price range is solid-state territory, with no tube amps available (although you may find something second-hand). But with solid-state models, you can expect to see a big range of tone-shaping features, from surprisingly advanced EQ controls to a series of built-in effects such as delay, tremolo and phaser. The exact tone and the amount of versatility you end up with will depend on the brand you choose, as each one brings something different to the table. Absolutely! Because spending $1,000 on a decent head then pairing it up with a 4×12 cabinet is rarely something you will use to its full potential – at least not in your bedroom. So affordable practice amps are a much better way to spend your money if you are looking for something to use at home or at low volumes, especially if you are a beginner. 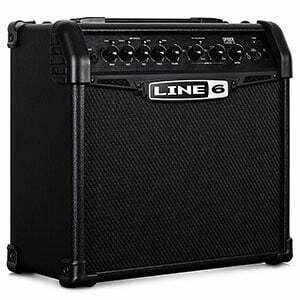 However, if you are able to stretch your budget and you aspire to jam with a band or perform in smaller gigs – or simply want more power and versatility – browsing the amps in the under $200 category is a smart move. Affordable amplifiers have become a necessity and an integral part of any guitarist’s home setup. They usually come with a few compromises to keep the costs low – whether power, versatility or quality control – but there is no better way to practice guitar at home than to have one of these at your side. The models we have highlighted above are by far some of the best you can get for less than $100 today. Good luck with your hunt for the best practice amp! No Berhinger products? The VIRTUBE VT15CD fits right under that Marshall at 119, and WAY more for your money than the rest of the offerings at a great price. Or does this go to the under 200? but there are better offerings at that point for the Bugera line. I just bought the Blackstar ID:CORE 10 for about $100. Best damned practice amp I’ve ever played out of!